In this guide we’ll take a look at the best LED torches for the UK market. What Is The Best Torch? This Olight S1 Mini Baton Torch is tiny but mighty. It is just 54mm long but produces 600 lumens which is pretty impressive. The unit is sturdily built and attractive to look at. The black aluminium alloy body has a nice feel and a pattern that make it extra grippy. This model wins the top spot for the best torch for the money. It comes with a pocket clip and a lanyard. I would definitely recommend using a lanyard as this torch is so small you could easily lose it otherwise. It also has a magnet in the end cap, so you can attach it to metal surfaces which is handy in the car or workshop. The torch comes complete with the 2 RCR123A rechargeable batteries required. They can be charged while in the torch with the Micro-USB cable provided. There is an indicator to show when the battery is low. You can buy spare/replacement batteries if required. This torch is powerful and very bright. On the brightest setting the battery will only last a couple of hours, however, this mode is probably unnecessary most of the time. It’s power and brightness makes this the best LED torch for the UK market. On lower modes, you get considerably more time between charges. To turn the light on or off you simply press the power button. To change the mode, you hold this button down and the torch then cycles between low mode, medium mode and high mode. There are also three other modes available and these are moonlight mode, turbo mode and strobe mode. In moonlight mode, the torch will run for up to fifteen days and it does give enough brightness to allow you to look for things in the tent or car. It also has a lockout setting to prevent the torch being accidentally turned on in your pocket, rucksack or glove box. Overall this is a well built and handy torch that has a lot of power for its tiny size. The rechargeable batteries mean there are no additional costs once you have purchased this torch. In my opinion its the best torch for the UK market! This classic Maglite 3D LED Torch has the looks and durability we expect from Maglite with the efficiency of LED technology. This is probably the brightest torch I have ever used. At full power it produces a brightness similar to that of a car’s headlights – it’s really quite astounding. If you are looking for the best LED torch this might be just the ticket. The torch produces 625 lumens and has five modes: momentary, full power, low power, eco and strobe. You can adjust the settings simply and easily by repeatedly clicking the power button. The beam is also adjustable from spot to flood. In eco mode, the batteries will last up to 117 hours and still produce 58 lumens. In full power, which is really bright, I ran it for almost 16 hours on one set of Duracell batteries. The torch requires 3 D batteries which are unfortunately not included. The torch is solid and well built. It is also classically stylish with a black aluminium body with a patterned band for extra grip. A solid stylish torch that will provide you with a really powerful light. It’s incredible power makes this one of the best LED torch models available for the UK market. 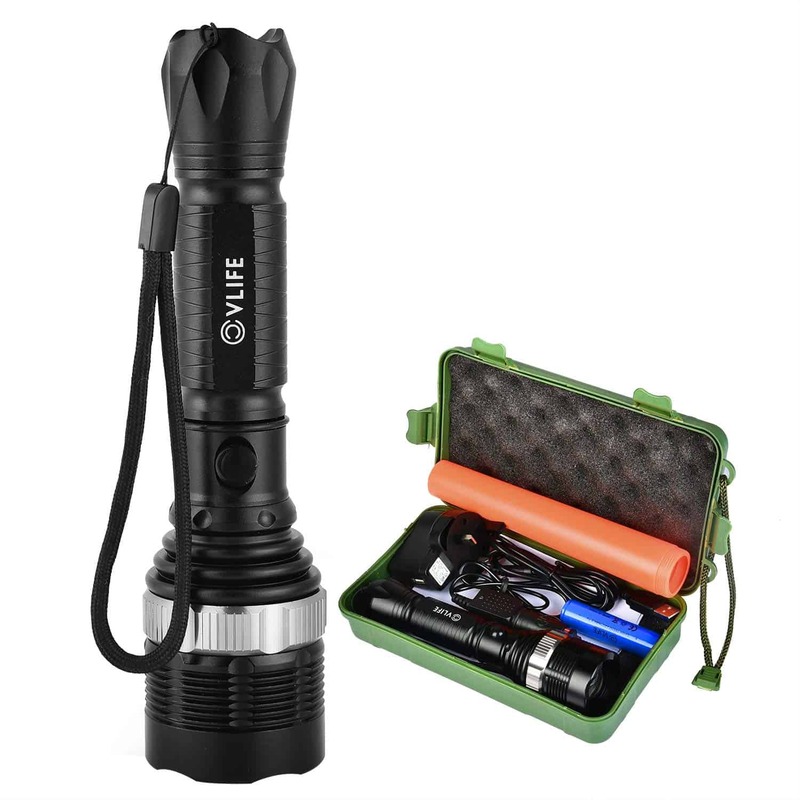 This CVLIFE 1800 Lumens LED Flashlight produces an incredible 1800 lumens and the beam is adjustable from spot to flood. It also has three modes: high, low and strobe. The casing is well made and constructed from black aluminium alloy. It is not as sleek and stylish as the Maglite but it has a rugged, military looking style of its own. The torch comes with a 18650 Rechargeable Battery, a wall charger and a car charger. You do not remove the battery to charge the unit but simply plug in the cable to the torch body. The battery will last a good 5-6 hours on full power. As it comes with a rechargeable battery and two types of charger and has plenty of power I would say this is a good value for money product, and it’s one of the best rechargeable torch models to go for. This ThorFire S70S Super Bright Torch would be ideal for outdoor activities as it is fully waterproof and very powerful. This is a large, weighty torch. It has a hard-anodized aluminium casing in black that looks quite stylish. It comes with a handy carrying strap. This torch requires 2 18650 batteries or 2 button top 26650 batteries which are not included. It will run for approximately 72 hours on one set of batteries at low power. However, this is bright enough for most outdoor activities. At the highest output int last for just under four hours. The mode can be changed by a simple press of the power button and the memory means the torch remembers the last setting used and goes back to that when you switch it back on. This Ledlenser Professional LED Torch is the priciest of the ones reviewed, however, it is a solid piece of kit that is suitable for the most demanding of situations. It is a large torch made from tough, aircraft-grade aluminium with a matt finish for extra grip. It is water resistant and also looks very stylish. Considering the design, this is probably the best torch I would go for personally! It features an extra-large power button that is easy to use even when wearing gloves. The torch has three modes, boost, power and low power. The torch comes supplied with 3 x D Duracell batteries and has a belt clip for hands free use. It also comes with a handy belt pouch, so you always know where to find it. The beam is 450 lumens; however, it has an Advanced Focus System and Smart Light Technology to generate a homogenous bright white light from spot through to flood beam. The beam can reach up to 420 metres. Ledsenser torches also have replaceable parts meaning that when a part fails you do not have to replace the whole unit. It also comes attractively boxed so would make a nice gift. If you need a torch on a regular basis in tough conditions this could be the best torch for you. The brightness of an LED torch is measure in lumens. To consider what will be the best torch for your needs, take a look at the number of lumens you will require. The higher the lumens, the brighter the torch. However, using higher lumens will also drain the battery more quickly. For everyday use such as camping, walking at night or looking for things in the shed then 450 lumens is probably the best torch for you. The higher lumen products would only be necessary for more specific uses. The quality of the bulb, the torch technology and the battery will also affect the brightness so bear this in mind. More lumens are not necessarily better or necessary. Torches with built-in batteries are quite handy as you don’t have to search around for batteries when you need a light. It also prevents the batteries being taken for the torch to be used in other devices! However, once the battery fails you may have to replace the whole product if the built-in battery cannot be replaced. Separate rechargeable batteries are handy as you can have spare ones on charge while you are using the current ones meaning you are never without your torch. Why do torches have blinking, strobe or SOS modes? A blinking or strobe light helps vehicles see you more easily if you are walking by the roadside. The SOS mode uses Morse code – three short flashes, three long flashes, three short flashes – to signal for help in the event that you get into trouble.